K9 Advantix II works great! Only product that works for my dog! Got rid of fleas when Frontline wasn't working! Best topical flea & tick prevention product. Period. K9 Advantix II is GREAT!!! Love it. No more fleas and ticks! Excellent coverage, easy to use. Great product, no problems at all. Not as good as Original Advantix! 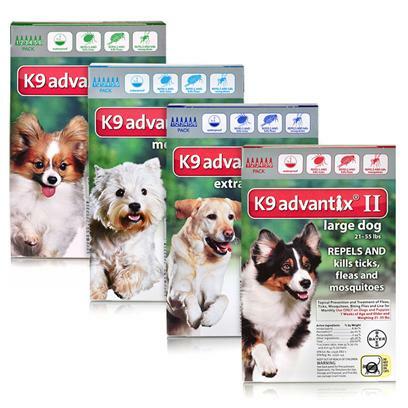 K9 Advantix II has great features. Excellent product, quick and easy to use. The products fights against fleas, ticks, etc. This poduct is perfect for dogs that love the outdoors! Fleas are not effected by this stuff! My dog has more ticks than ever!